The collapse of the Rana Plaza in the suburbs of Bangladesh’s capital city on 24 April 2013 did not just leave a trail of devastation for all the thousands of workers involved and their families, something which will be felt for years to come. But in the rubble of the eight-storey Dhaka building that housed factories making clothes for brands such as Benetton, Mango, Matalan, Monsoon, Primark and Walmart, other painful reminders were also exposed. Many of them, alas, we have known for a long time and probably cease to shock us any longer. They include further examples of the global network of greed which connects ordinary shoppers in "first world" countries to multinational companies and in turn to local elites in "third world" cities. Many accounts of utter inhuman, slave-like conditions have been unearthed in which often poor, exploited women live and work to feed the desires of wealthy, gluttonous metropolises. Of the repressive political-business-crime nexus which ensures labourers have no rights, welfare or security. Of the absolute disregard for workers and the vilification of trade unions by consecutive government bureaucrats/factory owners, who are usually the same individuals. Of the sheer ineptitude of government bureaucracies to maintain laws and regulations which may protect employees. All this, against the backdrop of the worst industrial disaster in Bangladesh’s short history where over a 1,000 people were killed and 2,500 injured, makes a certain question even more insistent. Is there no alternative to the particular path of economic and social development that the country seems to have chosen for itself - an alternative that places the respect of life at its core, and which denies the Rana Plaza any claim to be a foreshadow of its future? Perhaps the past offers, if not an answer, then the space in which one might be found. To that end it seems fitting at this stage to shine a light into the country’s earlier experiment with state-run industrialisation. In particular, I want to highlight a period, not so remote, when it was believed both that the development of the country was not about a minority of people fattening themselves up on the backs of others, and that the national good and the welfare of workers were interchangeable concepts. Many hours northeast of Dhaka, away from the carnage of the Rana Plaza, in a remote coal-mining area on the border between Bangladesh and India, groups of men climb to the top of one of the hillocks that litter the borderland to watch the sun set. It is illegal to do so, as they are officially entering no-man's-land and capture carries with it the threat of either a Border Guard Bangladesh grilling or an Indian Border Security Force beating. Ordinary Bangladeshis join Indians in this most high risk of pursuits. A plastic bottle of whisky, Officer's Choice, is passed around. It is one of the many ways people on both sides of the border connect and socialise with each other, something the impending barbed-wire fence India is building around its neighbour attempts to disrupt. The hillock doubles up as the most auspicious place to be a diviner of time. The magnificent view from this height allows even the novices amongst these plucky men the ability to recall the past and foretell the future. Immediately below, on the Bangladeshi side, is the remnant of the Khonighat Limestone Mining Project (not its real name). Today, the site is eerily quiet, a stark contrast to its heyday. It now looks like a ghost town, picked up from somewhere else and dropped here. Scattered around the insides of the perimeters of the fence are the skeletons and entrails of a decomposing industrial past. 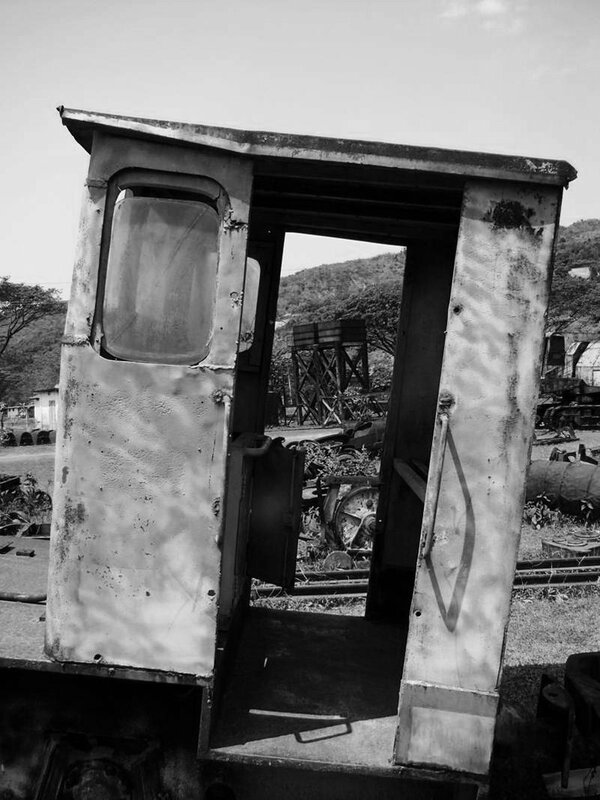 Large debris of rusting machinery, lines of railway tracks (that have neither beginning nor end) and disintegrating earth diggers, all lie strewn around. A massive, metal crane perches gracelessly at the main entrance. The remnants act as an allegory of the collapse of the ideology that once created and sustained the place. The decaying houses and abandoned office buildings, built uniformly and painted the same yellow colour, are largely derelict. There is no difference between the few that continue to be occupied and the majority of the houses that are deserted. Everything seems to have been organised and planned once, but has since fallen foul to history. Like all deserted places of the imagination, few inhabitants actually live here. Most people of working age have left. From the state of the place, it seems like it has forever been this way: timeless, static and unchanging, seemingly disconnected from developments taking place outside in the world. But this is not so. Its present condition belies the drama of change that was once wrought upon here. At the same time, it speaks volumes about the tragic events that recently unfolded on the outskirts of Dhaka. Looking at this ruin, one would be forgiven for not knowing that the Project (as locals still refer to it) had once claimed to be at the forefront of the future for thousands of workers who migrated from across the country to participate in the promises it offered. The developmental trajectory post-colonial states followed in the mid-20th century is writ small on the Khonighat Limestone Mining Project. Set up in 1965 by the then Pakistani government (East Pakistan became Bangladesh in 1971), its aim was not simply to furnish the newly independent country with limestone, though this was of course one of its core functions. It was at the centre of a much larger, utopian goal that constituted a project of a different order. Migrant workers who came to live and work in the Project in the mid-1960s were to be part of the modern Pakistani industrial workforce and more importantly, enlightened citizens of the new Pakistani state. This rhetoric was not simply top-down state and Project management gobbledegook. Workers and their families at all levels of the industry truly believed in the vision. It is not difficult to see why. Almost immediately after it was established, the physical, social and personal worlds of those who came to live and work here began to ring with the dizzying sounds of change. All of it was unprecedented in scale. Modernisation, the theory and practice, dictated that once peasants moved from the field to the factory, these hitherto “backward” people would be propelled into “civilisation” and share in the prosperity of the “developed” world. The idea was that the state was at the centre of capitalist development programmes, preoccupied as it was with national progress, or in other words, the transformation of the whole. Therefore, state-led development concentrated upon spectacular public works. Around the world, entire new cities were carved out: Brasilia (Brazil), Islamabad (Pakistan) and Chandigarh (India). More commonly, it involved building infrastructure (roads, bridges), developing large-scale power projects (hydroelectricity dams, power stations), constructing industries (manufacturing, refineries, factories) and civic institutions (courts, hospitals, schools, universities, libraries, parliaments). Generally this was concentrated in urban centres; but “unknown”, so-called “peripheral” places, such as the region where Khonighat is located, were also targeted. These spaces were to be instantiations of modernity, exemplars of what was to come. Their functions were to act as transformers, changing everything around them in the most remote of locations and amongst the most diverse range of people. 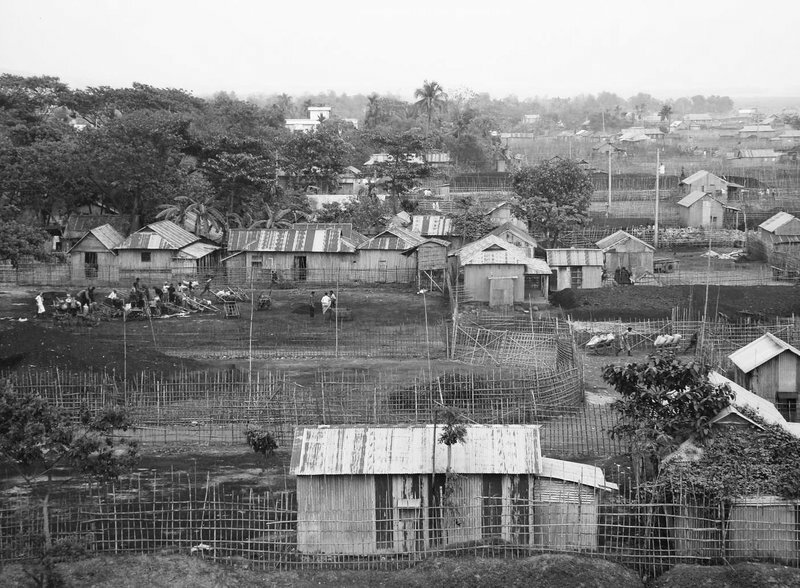 In Khonighat, quarters were constructed besides the Bangladesh-India border to house Project employees. The senior officers’ colony, Grade 1 - accountants, doctors, engineers - consisted of bungalows with a large, covered veranda, overlooking a garden at the front. Over time, fruit trees and flowering bushes were grown. The view from the main windows was of the large rectangular lawn around which the township was built. Inside, there were two or three spacious rooms, a small kitchen and a bathroom. Officers were able to accommodate their families and a maid comfortably. The bungalows had locally generated electricity and indoor plumbing, including western toilet and flush. The homes for the intermediate staff - administrators, teachers, nurses - were built along a grid system and were closer together. They also had electricity, plumbing and draping bougainvillea bushes. The houses for the lowest grade and the majority of employees - labourers, explosives experts, radio/crane operators, security, foremen, contract workers, carpenters - built on the inside fringes of the Project perimeters, were made out of tin. The barrack-like blocks were built to accommodate large numbers of working men. They would share squat toilets and a well for water but they too had electricity. There were no ethnic or religious enclaves. People of different backgrounds had to live with one another. Roads and communication links were established. A school was built, as was a clinic, water supply, graveyard, post office, bank, guest house and a bazaar. Though secularism was one of its underpinning ideologies, a mosque was constructed as was a Hindu temple. 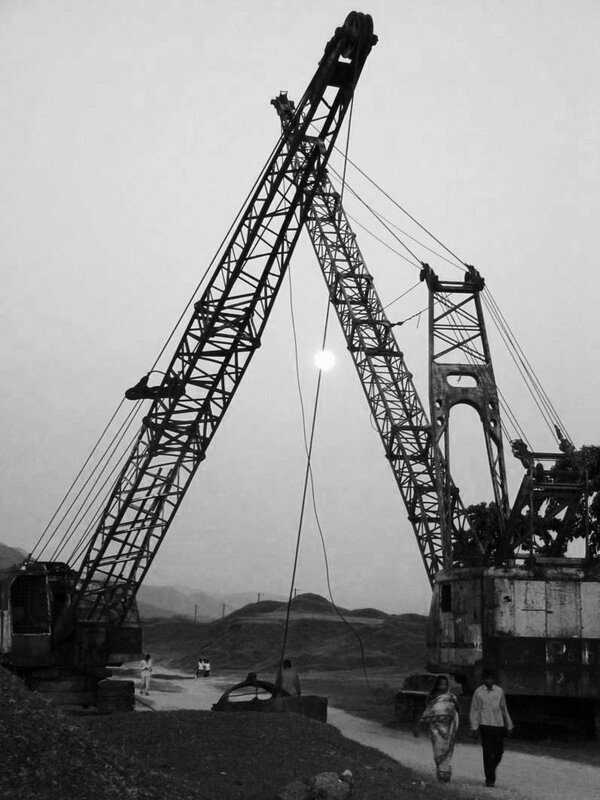 The limestone extraction was on such a scale that an unprecedented amount of new technology and machinery was required. For those workers who went down into the quarries, the industrial landscape they encountered at the border was bewildering. The technological infrastructure and machinery seemed like it had emerged from another world. 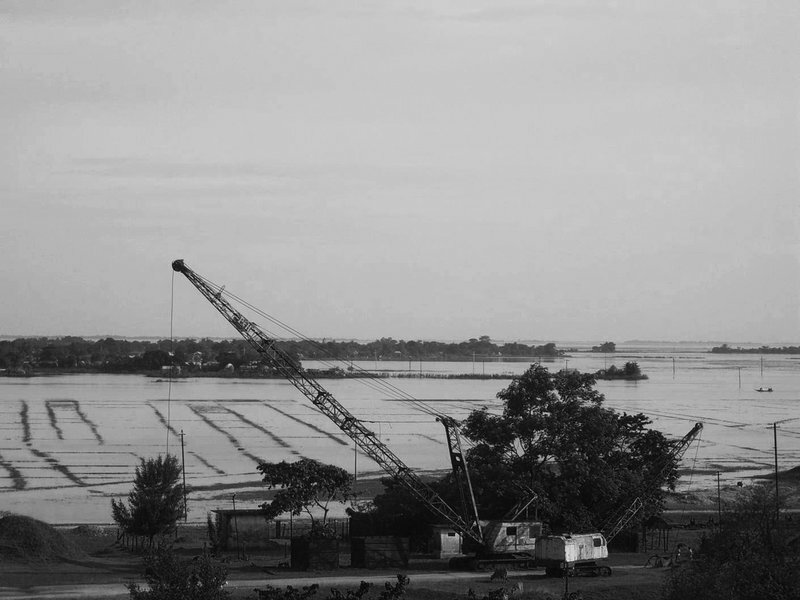 At the time, there were only three metal cranes in the whole of East Pakistan, a Project resident recalls. One was in the Chittagong Port (in the southeast of the country and which itself was undergoing modernisation) and the other two were in Khonighat. Project archives show that during the monsoon, officers travelled by speedboat between Khonighat and the district’s main administrative centre. The distinct mode of production that the latest infrastructure required saw the very way people lived and worked having to adapt. The Project became a coveted posting because employees and their families were taken care of, a valuable lesson which today’s garment-factory owners would no doubt be advised to learn from. Ex-workers describe the Project school as a “source of light in a sea of darkness”. Even during the privations of the liberation war in 1971 when Bangladesh was founded, it remained open. They talk about a new social order beginning to crystallise and an organised and regimented lifestyle forming. Extensive provisions for workers were introduced. This included a trained labour force, health and safety regulations, set wages, trade unions, fixed working hours, lunch breaks and pension system. These facets were considered to be vital for the new economy but also for the new society. Most ironically, these very issues are at present being examined as future possibilities in the proposed amendment to Bangladesh’s labour laws. What is most startling about the discussions being held by multinational garment companies, the Bangladeshi government and NGOs is that they seem so antiquated. The rights of the worker, the health, safety and wellbeing of those who are the backbone of an industry were ideals that were already in practice half a century ago. The technology, the reliable source of limestone, the treatment of the workforce and the ideological incentives meant increased output, and soon the Project began to play its role in the nation’s larger industrial revolution. But it was not to last. The Project closed its gates for the last time in 1993. Ex-Project workers continue to believe it was large-scale corruption and mismanagement that eventually saw its demise. This was something that was visible and obvious to everyone who lived, worked and had a stake in the Project. The official reason employees were given however was that reserves of limestone had been exhausted. With over-extraction, the limestone seams apparently ran too low for the existing machinery to reach. As a result, and with the liberalisation of both the Bangladeshi and Indian economies, it became financially prudent to import limestone from India, rather than purchase new technology that extracted at much lower depths. This evaded the spiralling costs of the enterprise as well as the expansive labour force and all of its concomitant costs. But global forces had a role to play in its ruin too. With the state heavily indebted to foreign aid, the World Bank and the IMF forced Bangladesh’s democratic and military rulers to liberalise the country’s economy and to privatise or close down public-sector industries. The project of modernisation and the worker’s utopia in Khonighat lasted around thirty years. The majority of the official staff were transferred out of the area. Some fifty or so middle-ranking clerks, administrators, teachers and their families remained as there were no positions for them to fill elsewhere. Whilst some of the infrastructure and machinery were dismantled and/or sold off, most remains where they were left, on the last day of operations. There is a profound sense of anxiety and gloom about the present and future for many of these men. Not so long ago, some of them would have worn a shirt and tie to work. They could expect to be looked after when they were ill and their families to be provided for when old. All this has vanished. The ideals of full employment, workers' rights, centralised bureaucracies, state benefits, or even the centrality of the state, now seem like mythical tales in comparison to what currently exists in Bangladesh (and indeed around the world where the role of the state is being shrunk). They gather around each other as one imagines war veterans who have experienced shell-shock do: their reduced horizons of life-chances leave them with little to do but reminisce about the past. Whether this past actually existed in the way they remember is not the point. They believe it and act upon it, passing the memory on to their children. "My relationship to Khonighat is very complicated and will continue to be so. After many years of mismanagement, corruption and greed, I had to hear the last siren, calling the Project to an end. I was really sad when I heard that it is closing. Everyone that had been involved with it was speechless because even until the last moment, we knew how important the Project was and how much it had helped us all to survive. Now I do not live here, but when I come here, what goes through my mind is what we had and how that has become a disaster." This story of abjection is not consistent, however. 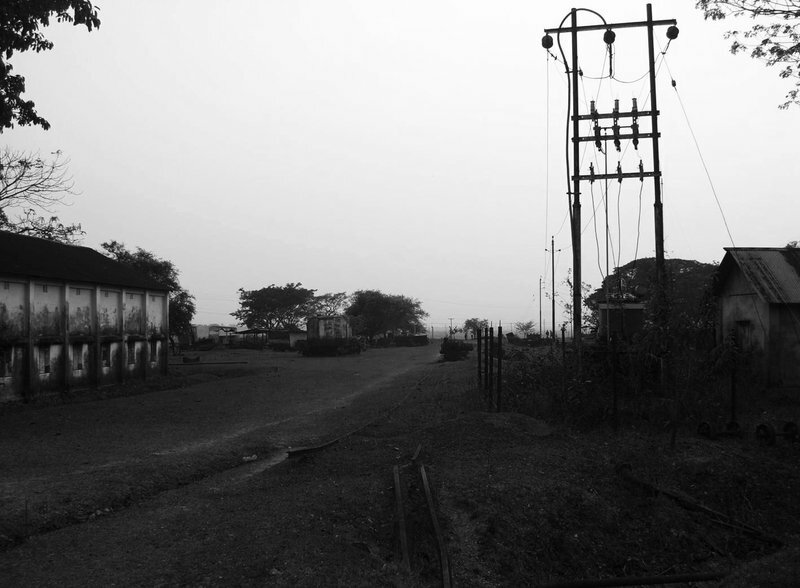 These days the cross-border coal trade between Bangladesh and India is monopolised by men who were formerly limestone labourers at the bottom of the Project hierarchy. Many were discarded early in the Project’s decline, their fate no longer its concern. Several of these men have worked up from the very bottom and have amassed huge wealth and respect. Ex-Project workers say that unlike what previously existed here, the current economic dispensation is based on selfishness, market morality and greed rather than on workers’ wellbeing or national development. No infrastructure, let alone schools or health centres have been built since the Project closed down. 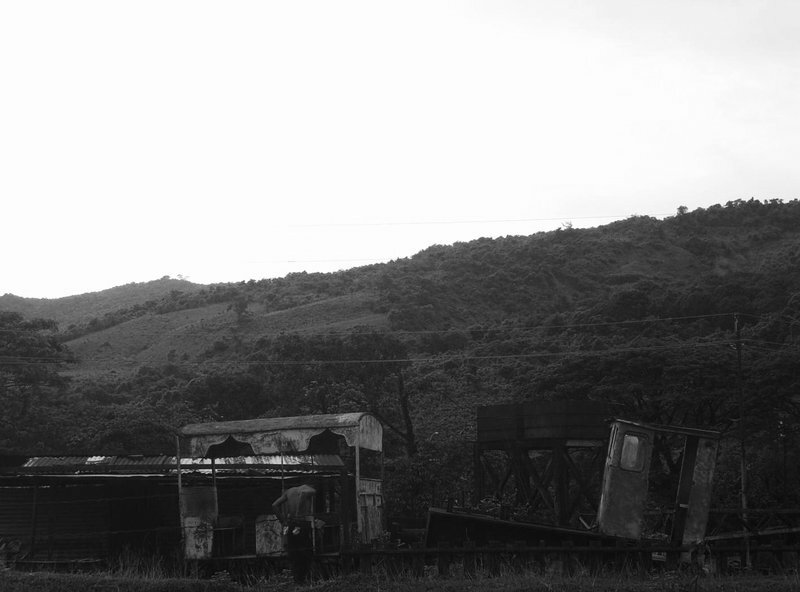 They point to the thousands upon thousands of migrant labourers who flock to the border to work in the coal trade. They have no legal protections, healthcare, civic amenities or trade-union rights. These were examples of principles that existed in the Project, but with the neoliberal reordering, have now disappeared. It is not just labour in the cross-border economy that is required to be cheap, exploitable and expendable. For the thousands upon thousands of migrants who flock to Dhaka’s garment industry every month, life is not so different. Fear over the present and future pervades their existence too. These emanate from the conditions in which they work, the ever-present dangers of fires, and building collapse as well as the precarious nature of their job (they could be sacked any day). Many of the female garment-workers I have spoken to say all they want is that the factories they work for to provide them and their families with somewhere to live, daycare services for their children and to be paid on time. It is too easy to say that we need to learn from the past. It is quite another thing to actually do so.